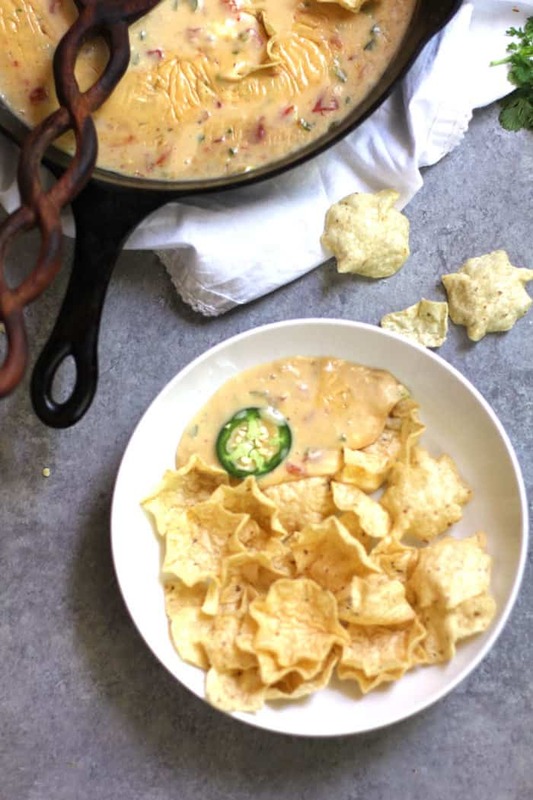 Creamy Jalapeño Queso combines a simple roux with Rotel, milk, plenty of cheese, and jalapeños. Perfect for parties and game day, and you can easily adapt the spice level to your personal preference. We eat tons of avocados at home, but I rarely make queso now, because we are empty nesters, and it just doesn’t get eaten. 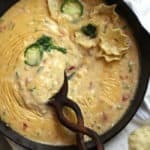 I usually wait for a party or a big game day, or when my boys are home, to whip up a batch of this cheesy goodness. 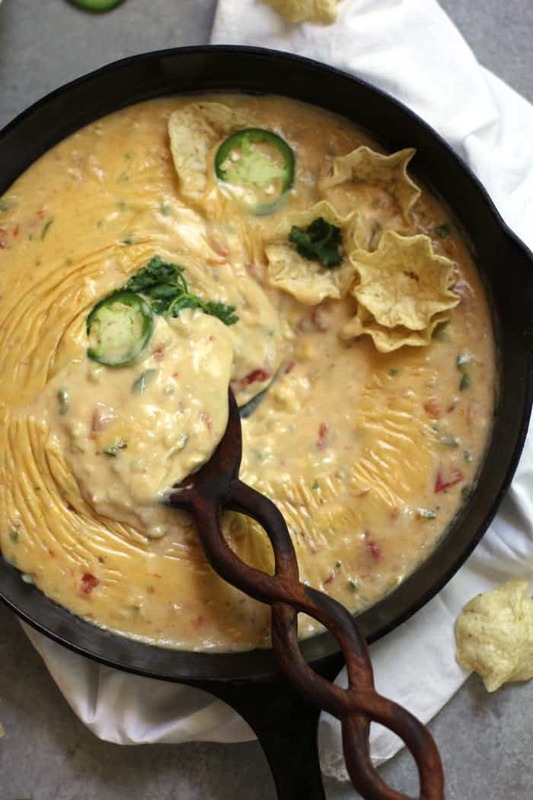 To make this jalapeño queso, you follow a few simple steps. Saute the diced onions, jalapeños, and garlic in olive oil. Add spices and flour, and stir until absorbed. Add milk and Rotel, and simmer until slightly thickened. Stir in all of the cheese, and continue stirring until creamy. A roux (or béchamel sauce) is the magic sauce that holds everything together in many dishes. With a few extra ingredients, it becomes the base for Mac and cheese, queso, gravy, and so many other recipes. The basic ratio for a classic béchamel is equal parts of fat to flour, and then milk, or other liquid (amount depends on desired consistency). For this recipe, I used 2 tablespoons of olive oil and flour, plus 1.5 cups of milk. Omit the seeds of the jalapeño, or a portion of them. Skip the Rotel and add regular diced tomatoes. Tostito Scoops work the best for this recipe, so you can SCOOP it all up. or any Mexican food (tacos, burritos, crunch wraps). You can also freeze the queso in an airtight container, for up to three months. Make it ahead and bring it out for game day or any last minute party. 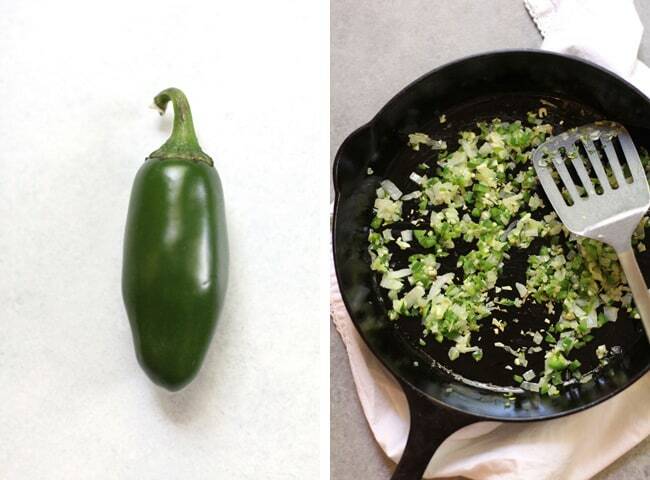 In a cast iron skillet (other other skillet), sauté the diced onion and jalapeño in olive oil, over medium high heat. After about 4-5 minutes, add the garlic and stir another 30 seconds. Add the salt, pepper, cumin, and flour, and stir constantly for a minute or two, or until the flour is fully absorbed. Add the Rotel and milk, and reduce heat to medium. Let the mixture simmer until thickened, about 10 minutes or so. 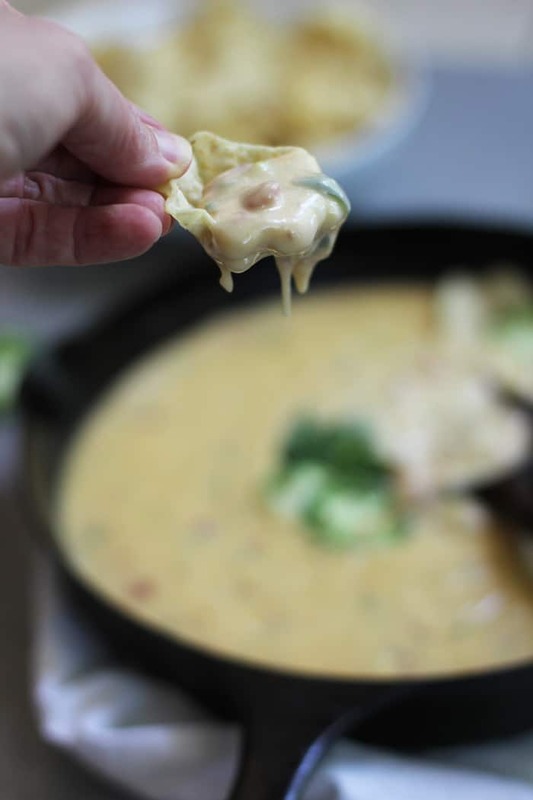 Reduce heat to low, and add the cheese and cream cheese, stirring constantly until everything is melted and creamy. Remove, and add extra jalapeño slices and chopped cilantro. Serve with Tostito scoops. If you don't like spicy, you CAN 1) Omit the seeds of the jalapeño, or a portion of them. 2) Skip the Rotel and add regular diced tomatoes. 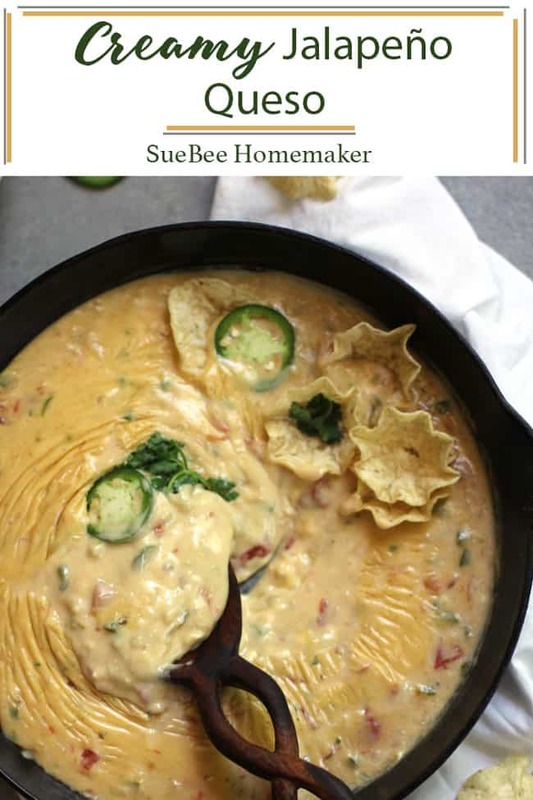 This queso is also great drizzled over chili, a baked potato, or any Mexican food (tacos, burritos, crunch wraps). Easy, tasty, and the whole family love it! I made taco meat and used this queso for nachos. Yum! This is always a hit at parties! An awesome recipe!